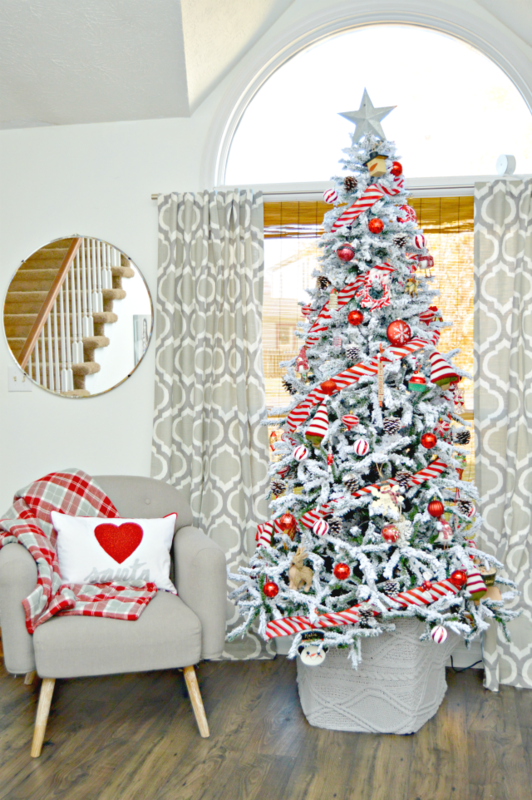 It’s beginning to look a lot like Christmas around here, and I am in love with our red and white Candy Cane Themed Flocked Christmas Tree! This year I really wanted to go with a red and white candy cane theme for our tree without it looking too juvenile. 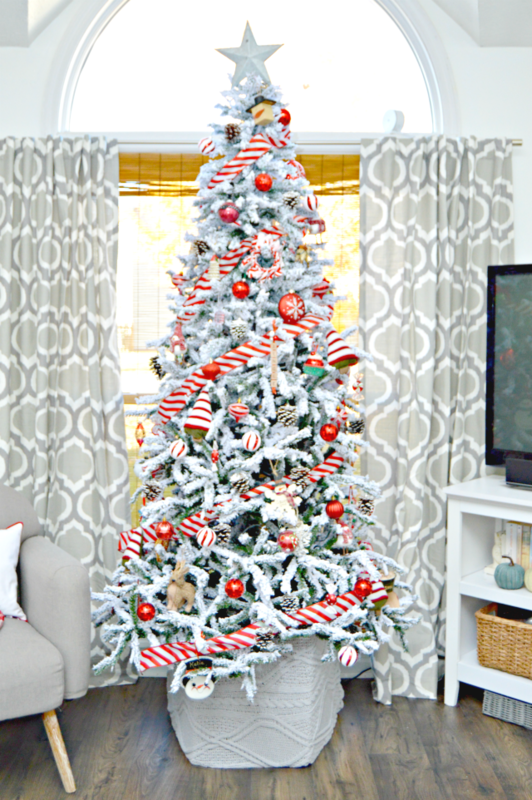 I didn’t want to just hang a bunch of candy canes all over, but I really wanted some sort of candy cane ribbon and lots of red and white ornaments. I have always wanted a flocked tree, and this year I finally bit the bullet and got one for our living room. It is perfect for the red and white tree I had envisioned, and now I’m not sure I’ll ever have a green tree again. The flocking just makes our living room feel like a winter wonderland. This lovely Flocked Christmas Tree is one of many amazingly beautiful Christmas trees from Treetopia! It came beautifully packaged within a few days of ordering and I couldn’t wait to get it up in our home! 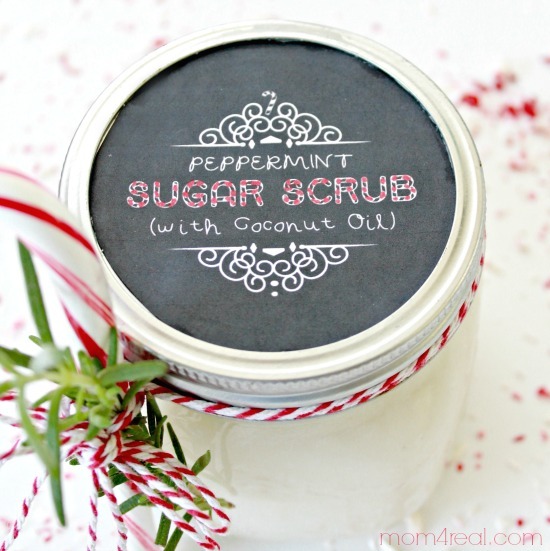 After Thanksgiving, my daughter Kate and I love to make Christmas ornaments and gifts to give to family members, teachers and friends, and one of our favorite gifts to make is Peppermint Sugar Scrub…you can find it and the printable labels HERE!…it was definitely the inspiration for this tree! We also love the smell of peppermint candles, dipping candy canes in hot cocoa…you name it…if it’s peppermint, we love it! 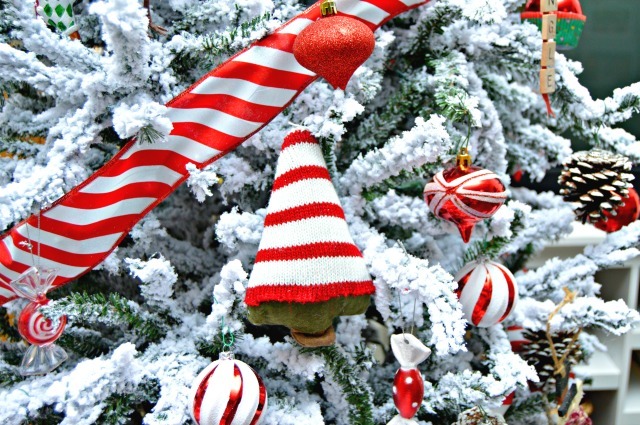 I saw these adorable Knitted Christmas Tree Ornaments and knew they would be perfect for our tree! They tie in perfectly with the color scheme and they remind me of my Grandma who used to crochet Christmas ornaments for me every year when I was little. 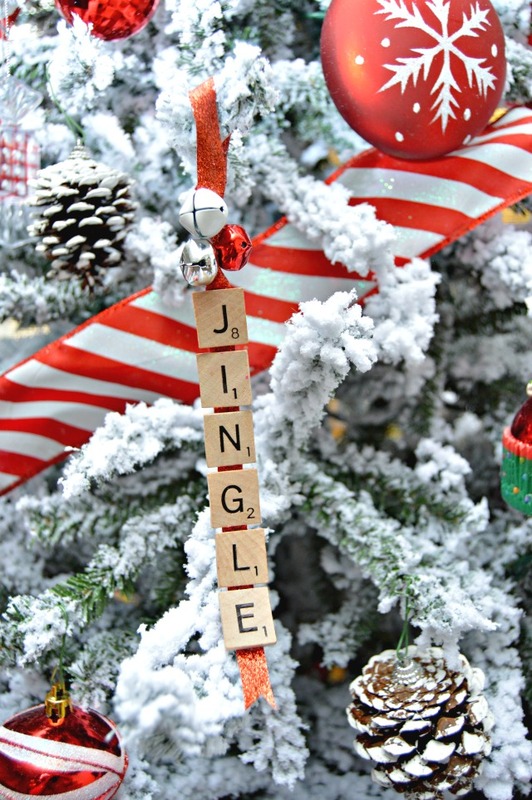 We already had tons of red and white ornaments, like this JINGLE Scrabble Ornament that Kate made a couple of years ago, and honestly, they never really stood out on our Christmas tree before. Now…I feel like they just pop! I also LOVE pinecones, so we sprinkled them around the tree too…doesn’t it just look like a tree covered with freshly fallen snow? I swear, even when it’s been warm here this week, I can close the curtains and feel like it’s the middle of winter! 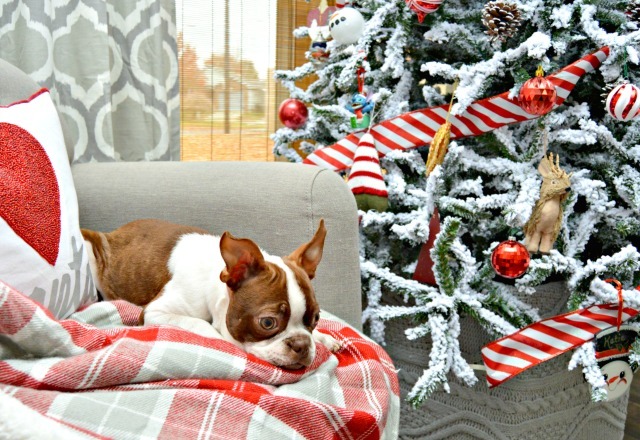 Our new puppy, Bentley is a big fan of the tree…he’s a little bit rotten though. I think he’s wondering if Santa will bring him coal in is stocking since he chewed up one of my baskets. Our whole family loves the new tree…I was a little worried that the boys would think it was a little too much, but they both gave it a big thumbs up! If you want to check out what I used to cover the bottom of our Christmas tree, you can check it out HERE! 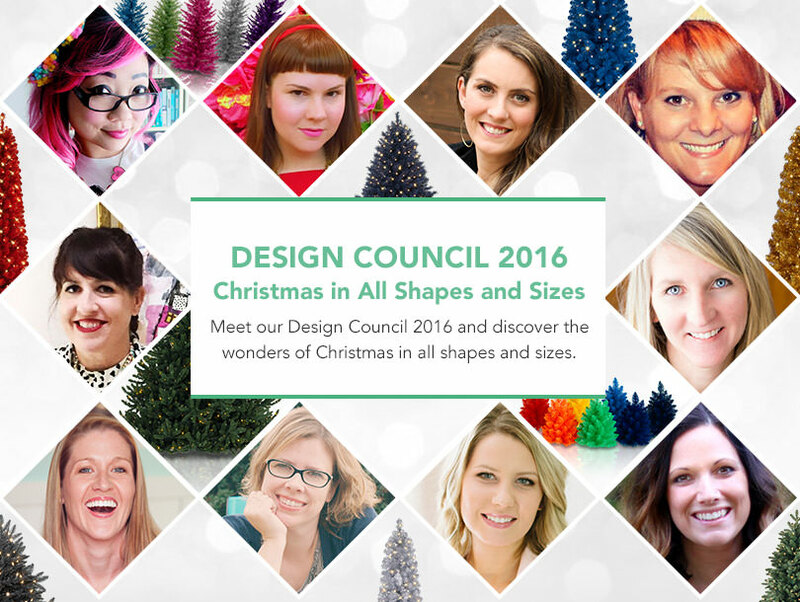 Be sure to check out the rest of the Treetopia Design Councils amazing and creative Christmas Trees! There are some really beautiful and surprisingly creative ideas that I would never have thought of, but can’t wait to try! Find them all on the Treetopia Blog, HERE! Do you have a book, LOVE all of your recipes! Not yet, Dale, but working on it! Thank you!